What do you do at this time of year for holiday cards? How do you know who to send the cards to or maybe how do you ‘choose’ who to send cards to? Is it based on the quantity of cards and postage you have or maybe on who send you a card last year? If it is based on last year, do you have to dig out the pile of cards from last year to know who was naughty and who was nice… enough to send a card for your fireplace mantle. Kidding on that last part, everyone has to be smart with their money these days so managing the holiday card mailing list is more important than just political. The subject came up due to a holiday card appearing at the office from a insurance agent. We talked in the hall about the many ways to use the iPad for better ‘card’ management. It came down to one of the team creating a template based on what we liked and disliked across each other’s solution. We are sharing the template out free, but it does require you have Bento on your iPad to work*. 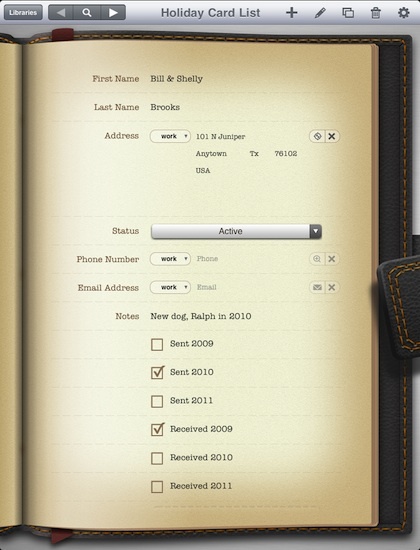 The template works on the iPad, iPhone and desktop versions of Bento. And, the data will sync across all of the devices via wireless so you can collect data when at your desktop or on the go with your iOS devices. So, the ‘template’. We have our template you can Holiday Card List.bentoTemplate and use for free. The idea is that you enter names and addresses of folks you get cards from or send cards to, only enter each name/address once. Then, check off which years you sent cards and which years they sent cards to you. We added a photo area that you can use to add a photo they may have sent you of their family or new pet… or you could use it for a photo of one of their more memorable cards. When it come time to address new cards, Bento desktop allow the export of list. Our use is actually to filter the list through the upper left corner ‘magnify glass’ icon within the iPad version. When chosen, a lit of cards/names will appear. Choose the icon in the lower right corner of that box and narrow your search. For example, choose the ‘Media or Checkbox’ “Do Not Display” and choose to filter out to only see the folks that sent you cards last year. You can always add to the list, start with the most restrictive filter and expand to include those you still want to send cards to. *We are long time… VERY LONG TIME, users of FileMaker Pro and of Bento. We are not happy that the makers of these software solutions have decided to not allow templates to be installed directly to the iPad. Instead, you must install the template to the desktop version of the software, then sync it to the iPad/iPhone to use there too. Data will sync between the two going forward. Bento isn’t expensive by any means, but it seems short sighted to force people to purchase both when they could just ID their templates to open with Bento when they are accessed by the iPad. We will continue to use and suggest the product, but publicly disagree with that forced purchase way of doing business.